International customers will be invoiced for shipping through email. 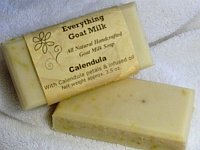 Calendula Goat Milk Soap has beautiful calendula petals and calendula-infused olive oil that make this soap especially soothing, and the light, natural chamomile fragrance is great for a relaxing bath! Ingredients: goat milk, olive oil, palm oil, coconut oil, sodium hydroxide (lye), castor oil, shea butter, avocado oil, fragrance, sucrose, sea salt, calendula, titanium dioxide. Net weight 3.5 oz.